As not-for-profit boards go, you're competent. You get the job done. Shouldn't there be more to life? You do seem to spend a lot of time on unimportant items. The mission, somehow, doesn't come up often: either everybody instinctively knows everything about the organisation's vision for the future or it's somehow drifted into the too hard-basket and been covered up with junk mail. As a board, you're supposed to feel that vision and to be able to communicate it. It's your piercing gaze that's supposed to part the mists of uncertainty and lead the organisation on to the sunlit uplands of successful achievement. And that doesn't really seem to be what the last few meetings were about. Are you a board at all, in fact, or are you just a group of people sitting around a table? Do you have a common understanding, a common purpose, a common direction? Is your board more than the sum of its parts? 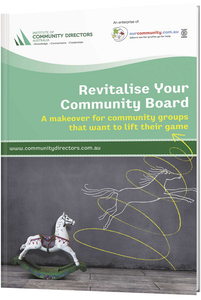 Even a board that has worked well in the past can become run-down or lose its focus. Are you coasting? Your board, you may well decide, needs new energy, new drive, new purpose. The chair can't do it all singlehanded. Neither can the CEO. The whole board, as a whole, must lift itself and start looking around. This book is pilates for your board - a pick-me-up that will leave you more flexible, more nimble, healthier and stronger.